Headquartered in Beijing, Xinhua News Agency is China's official news agency, as well as one of the world's major news agencies with more than 100 branches in Asia-Pacific, the Middle East, Latin America, Africa and other regions. In 2003, its subordinate Xinhua Financing Network Ltd. formed an international alliance with Agence France-Presse (AFP) of Finance. Xinhua Financial Network Ltd. purchased the news agencies of AFP Asian Finance in Hong Kong, Japan, South Korea, and Singapore and eight other Asian countries and regions, which expanded the coverage of Xinhua News Agency's international network. China News Service, also Beijing-based, mainly supplies news to overseas Chinese, foreign citizens of Chinese origin, and compatriots in the Hong Kong Special Administrative Region, the Macao Special Administrative Region, and Taiwan. Between 1950 and 2000, the number of Chinese newspapers increased nearly ten-fold. In 2005, more than 1,000 kinds of daily newspaper were published in China, with their circulation reaching 100 million, the highest figure of any country in the world. Targeted at different reader groups, newspaper formats are becoming increasingly diverse and colorful. Recent years have seen an important trend of newspaper reorganization. To date, 39 newspaper groups have been established, for example, Beijing Daily Newspaper Group, Wenhui Xinmin Associated Newspaper Group and Guangzhou Daily Newspaper Group. 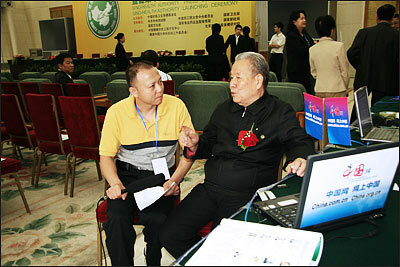 Since 2003, trans-regional cooperation among the print media has become a new trend. The Beijing News, invested and run by the Guangming Daily Newspaper Group and the Nanfang Daily Newspaper Group, was the first to receive formal government approval to publish trans-regionally. Not to be left out,Shanghai also presented Orient Observation Weekly, its largest shareholder being the Beijing-based Xinhua News Agency. China National Radio, China's official radio station, has nine channels broadcasting a total of 200 hours per day via satellite. Every province, autonomous region and municipality has its own local radio stations. China Radio International (CRI) is the only state-level radio station targeting overseas audiences. It has 300 hours of programs daily beamed across the globe in 38 foreign languages, Mandarin Chinese and four Chinese dialects. The programs cover news, current affairs, comment, entertainment, as well as politics, economy, culture, science and technology. Currently, CRI ranks third in overseas broadcasting time and languages among the world's overseas service radio stations. China's television industry has become a complete system with high-tech program production, transmission and coverage. China Central Television (CCTV), China's largest and most powerful station, has business relations with more than 250 television organizations in over 130 countries and regions. Following a global television industry trend, CCTV has moved toward specialization, introducing three specialized channels -- News and Children's Program in 2003, and Music in 2004. Altogether there are 3,000 television stations across the country. Large international expositions, including the Shanghai Television Festival, Beijing International Television Week, China Radio and Television Exposition and Sichuan Television Festival, are held on a regular basis. Besides judging and conferring awards, these festivals conduct academic exchanges and the import and export of TV programs. Shanghai has grown into Asia's largest television program trading market. Since the mid-1990s, China's traditional media have been supported with online media and of China's 10,000-odd news media across the country, 2,000 have gone online. Quite a number of famous websites have begun to appear, relying on information flow from the news media, and taking advantage of the latter's superior news coverage. Experts predict the merging in the 21st century of traditional and internet media into a multi-media news platform combining sound, image and text. Wowzine, established by www.southcn.com in August 2005, is one example of the wildfire expansion of online magazines. Since TV programs became available on cell phones via the whole network of China Mobile in September 2005, China Mobile has recruited over 150,000 subscribers to such services. There are three main ways of sending news media images and text to palmtops -- SMS messages, cell-phone reports and WAP sites. Many news websites are trying out "cell-phone newspapers." The China Daily website, for example, has developed a Chinese-English information service system to send the latest images and text reports on major happenings in China to subscribers' cell phones. On January 1, 2006, www.gov.cn, the official website of the Chinese government formally opened as a comprehensive platform for the State Council and subordinate departments, and for governments at all levels to release information and offer online services. Since China entered the WTO, the trend within China's media industry has been to form inter-media and trans-regional media operated on multiple patterns so as to meet competition and challenges from powerful overseas media groups. In 2001, the government put forward a goal of establishing trans-regional multi-media news groups. It also instituted detailed regulations on fund raising, foreign-funded cooperation and trans-media expansion. The China Radio, Film and Television Group, founded in 2001, integrated the resources of central level radio, television and film organizations plus those of the many radio, television and Internet companies, to become China's biggest and strongest multi-media group, covering television, Internet, publishing, advertising, etc. China's media are cooperating with overseas media groups. Since 2003, 30 overseas television stations, including Phoenix Satellite TV, Bloomberg Finance, Star TV, Euro Sports News and China Entertainment TV have landed, with conditions, on China's mainland. At the same time, CCTV's English language channel has reached US audiences via the News Group's Fox News Network.